Treat yourself to an all-embracing Israel tour, offering a perfect combination of sightseeing and leisure time. Explore the major sights of Jerusalem and Tel Aviv, as well as unique destinations like Masada. Experience the pampering and rejuvenating properties of the unique Dead Sea. This tour is fully customizable and can be tailored around your interests. Welcome to Israel! Upon arrival, you are met by your private driver, who transfers you to your hotel in Jerusalem for the check-in. The rest of the day is at your own leisure to relax after the trip. Alternatively, you can choose one of our carefully planned optional tours. 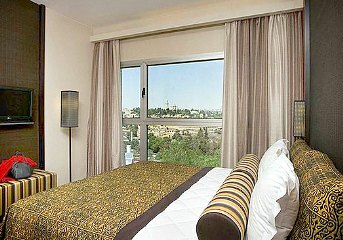 Today, you see unmissable sites of interest, and start with the Mount of Olives for a panoramic view of the city. Continue to Mount Zion, located on the southern end of the old city, and see the traditional sites of the Last Supper and visit King David's Tomb. In the Old city you start a walking tour of Jewish, Christian and Armenian Quarters. Walk along the Via Dolorosa and visit the Church of the Holy Sepulchre. A must-see highlight of Jerusalem tour is a The Western Wall, one of the holiest Jewish sites. Today you also visit Bethlehem - the biblical birthplace of Jesus and a major Christian pilgrimage destination. At the Palestinian border your change transportation and local guide takes you to Bethlehem. Together you visit the Church of Nativity, built over the cave venerated as Christ's birthplace in AD 339. After the visit, you drive through the city and get back to the Israel border to meet with your Jerusalem guide and driver. After the tour you return to the hotel and rest of the day is at leisure. After breakfast at your hotel, meet your private guide and start a 4-hour walking tour to discover the top sights of the New City of Jerusalem called Nachalaot which is translated as "inheritances". Here you get to know the cluster of neighborhoods in the center of the city. Take a great chance to feel like a local and continue to the atmospheric Machaneh Yehudah Market which is the true heart of Jerusalem. While discovering the market, you get acquainted with local culinary traditions and taste delicious olives, make a stop in the bakery of Hotchpuria, try legumes, casserole, pastries, halva, and organic tahini. Following the tour you may continue exploring the city on your own or return to the hotel. After the tour you are taken back to Jerusalem. Today you have time to continue an exploration of the city on your own or take one of our carefully planned optional tours. After breakfast at the hotel and check out meet your private driver who takes you to Tel Aviv. Upon arrival at the hotel, meet your guide and start your private 4-hour walking* tour to the old town Jaffa, one of the ancient port cities in Israel and the Mediterranean basin. Jaffa city is associated with Jonah, Solomon and Saint Peter as well as the mythological story of Andromeda and Perseus. Together with your guide, you stroll along the alleys of Old Jaffa, see the sculpture "floating orange", pass by the House of Simon the Tanner and the 19th-century St Michael Greek-Orthodox Church. Afterward, you arrive at the main Plaza of Jaffa and visit the Franciscan St. Peter’s Church, built on the remains of a Crusader Fortress. Then you continue to the flea market full of boutiques, laid-back cafes, pop-up bars and colourful street stalls selling vintage clothes, objects and furniture. After the tour you may continue exploration of Jaffa or return to the hotel. Exploring the port town Jaffa. The local currency of Israel are shekels. Although credit and debit cards are widely accepted, it is best to have cash on you for small purchases. Israeli weather tends to be hot practically all year round, so make sure to pack suitable clothing and sunblock.